Troy Baker is one of the most prolific voice actors in games, and his credits include Rhys from Telltale’s beloved Tales from the Borderlands series. 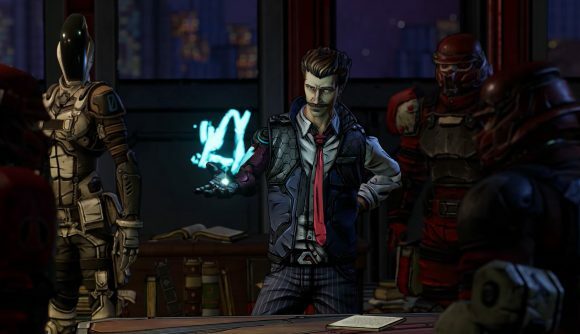 The first Borderlands 3 trailer suggests that Rhys will soon jump over to the main series, but it’s going to be without Baker’s voice. You may have seen already Baker’s repeated comments on wanting to be into the game, but now Gearbox boss Randy Pitchford says it was Baker who turned down the role in the first place. Even before that video, Baker’s Twitter feed was filled with messages tagging the official Gearbox account about how much he’d like to be in the game. Clearly, one or both sides aren’t giving a complete picture of what’s happening. Baker seems to indicate that he has been in direct contact with Gearbox about the role, but the exact dispute – and who turned down who – is currently unclear. The Borderlands 3 release date is set for September 13 – unless you really want to play it on Steam, of course. Regardless, you can follow that link for much more on everything we know about the game so far.